Mix flour, baking powder, salt, and sugar on low using a dough hook. Slowly add the cream in a steady stream. The dough should be wet-ish looking and pretty sticky. Don’t over mix, just a few seconds will do it! Keeping your scone dough in the same bowl, cover the dough and put it in the fridge for about 30 minutes. This makes the scone dough easier to work with. 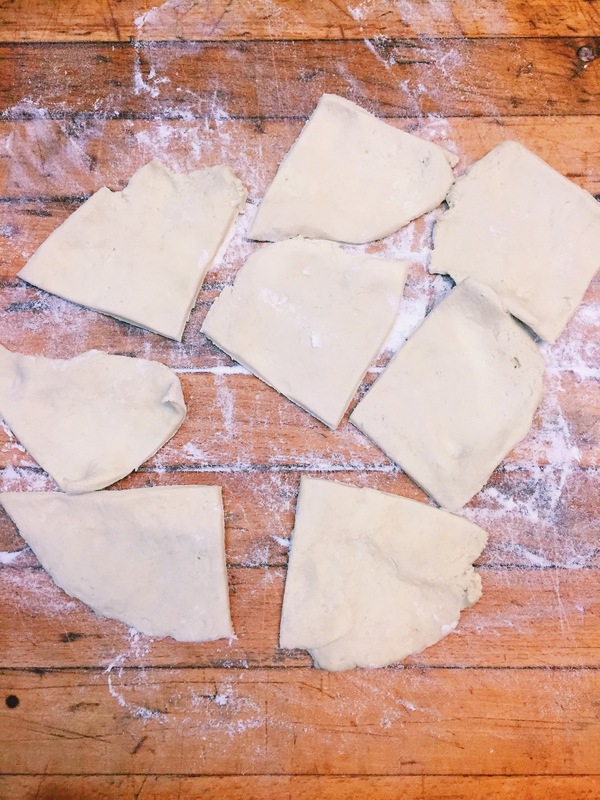 Once the scone dough is cold dump it onto a floured countertop and divide in two parts using a knife. 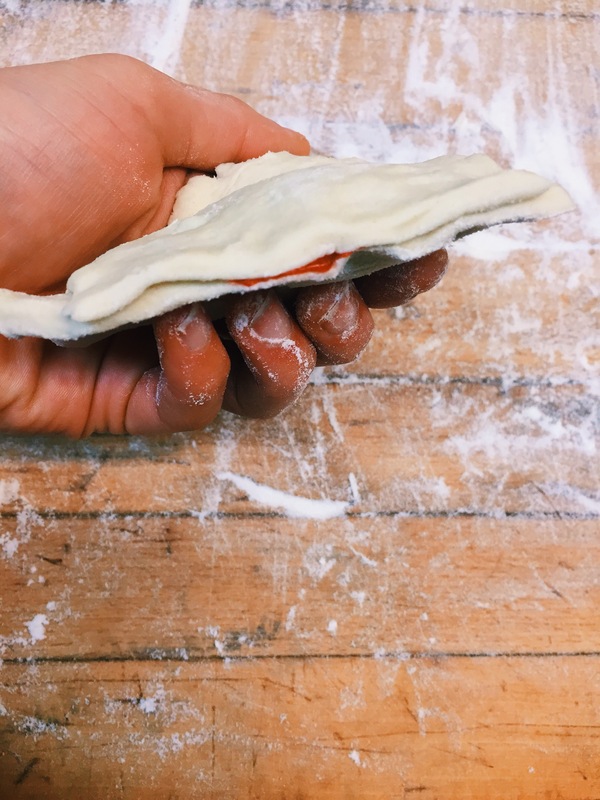 Using the palm of your hand, push the scone dough out one half so it is about the size of an appetizer plate (6-8 inches) cut the dough into 4 pie piece. Repeat with the other half of the scone dough and put all eight triangles on a parchment covered baking tray. Using raspberry jam or preserves (not jelly) put a tablespoon in the center of four off he triangles. Cover the jam with one of the triangles you have left and pinch around the edges so the jam will stay in during baking. Mix one egg and one tablespoon of water in a small bowl, using a pastry brush cover the tops of the scones so they will get golden and shiny in the oven. 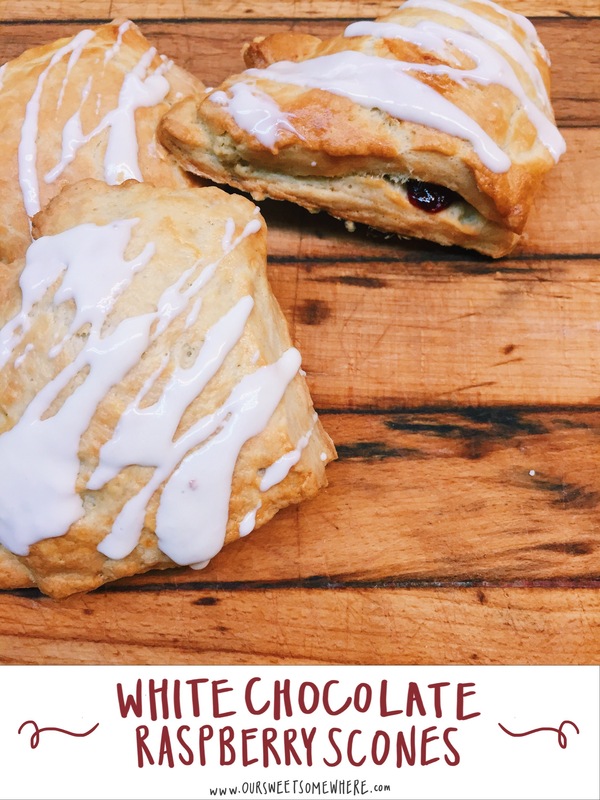 You can use either a white chocolate bar or 1/2 cup white chocolate chips for your raspberry white chocolate scones. In a microwave safe bowl, melt the white chocolate 30 seconds at a time taking the bowl out in between and stirring with a spoon to prevent the chocolate from burning. 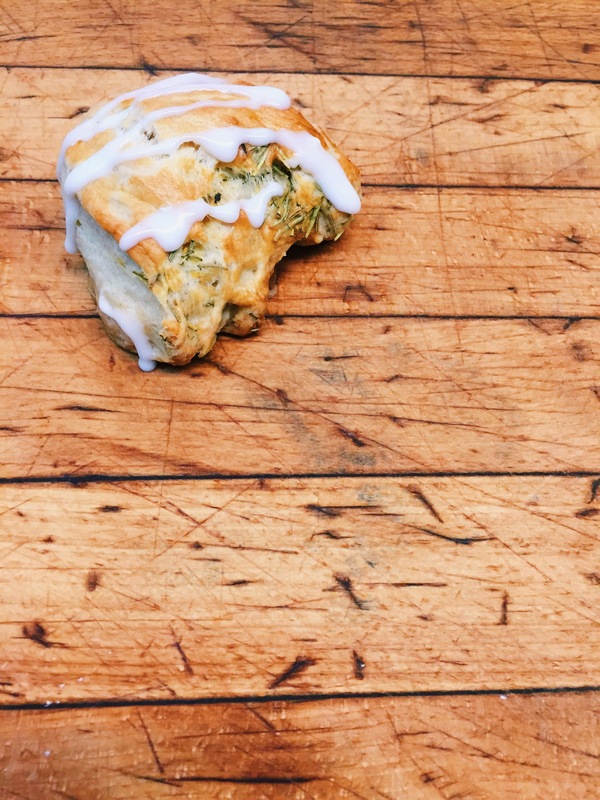 Drizzle the white chocolate over the scones while they are still on the baking sheet. Let them cool completely then transfer to a serving dish. Try out these raspberry white chocolate scones this weekend and tell us how they turn out! This entry was posted in Recipes and tagged baking, breakfast, homemade, Scones. Bookmark the permalink. ← Cut Your Closet in Half – 5 Tips to Get Rid of Extra Clutter! Thank you for such kind words Kristen!